Ma J, Sung J, Hong J, et al. Towards maximized volumetric capacity via pore-coordinated design for large-volume-change lithium-ion battery anodes. Nature Communications, 2019. Li Z, Liu K, Fan K, et al. Active oxygenen hanced homogeneous nucleation of Li‐metalon ultrathin layered double hydroxide. Angewandte Chemie International Edition,2019. Cai Z, Li L, Zhang Y, et al. AmorphousNanocages of Cu-Ni-Fe Hydr(oxy)oxide Prepared by Photocorrosion For Highly Efficient Oxygen Evolution Reaction. Angewandte Chemie International Edition,2019. Jiang Y Y, Upputuri P K, et al. Metabolizable Semiconducting Polymer Nanoparticles for Second Near-Infrared Photoacoustic Imaging. Advanced Materials, 2019. Wang Z Q, An H W, et al. Addressable Peptide Self-Assembly on the Cancer Cell Membrane for Sensitizing Chemotherapy of Renal Cell Carcinoma. Advanced Materials, 2019. Tu B, et al. Novel Molecular Doping Mechanism for n-Doping of SnO2 via Triphenylphosphine Oxide and Its Effect on Perovskite Solar Cells. Advanced Materials, 2019. 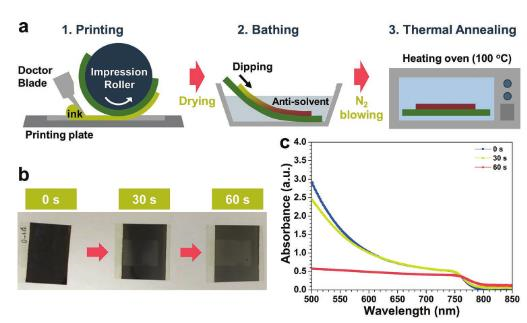 Kim Y Y, et al.Gravure-Printed Flexible Perovskite Solar Cells: Toward Roll-to-Roll Manufacturing. Advanced Science, 2019. Fan Y T, Zhou T J, et al. Modulation of Intracellular Oxygen Pressure by Dual-Drug Nanoparticles to Enhance Photodynamic Therapy. Advanced Functional Materials, 2019.